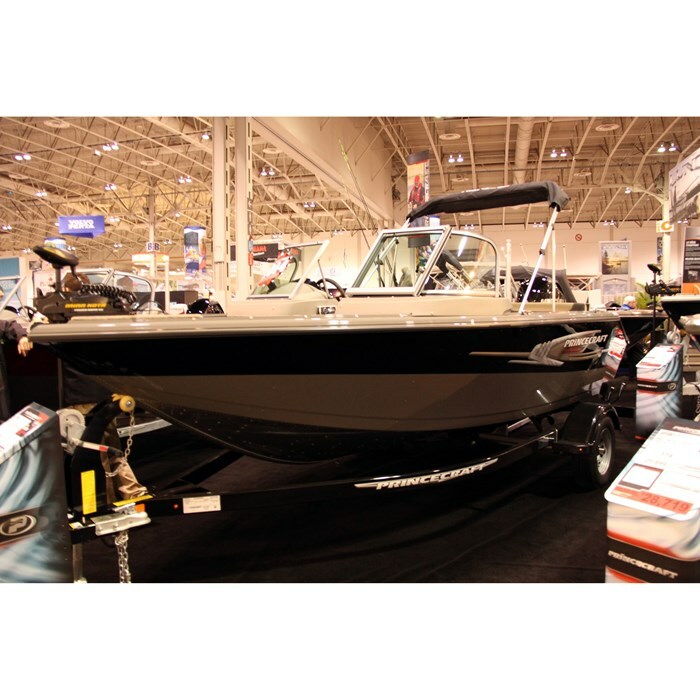 This year, 2014, marks the sixtieth anniversary of Princecraft Boats, a Brunswick Company since 2001, and a legendary Canadian boat builder headquartered in Princeville, Quebec. 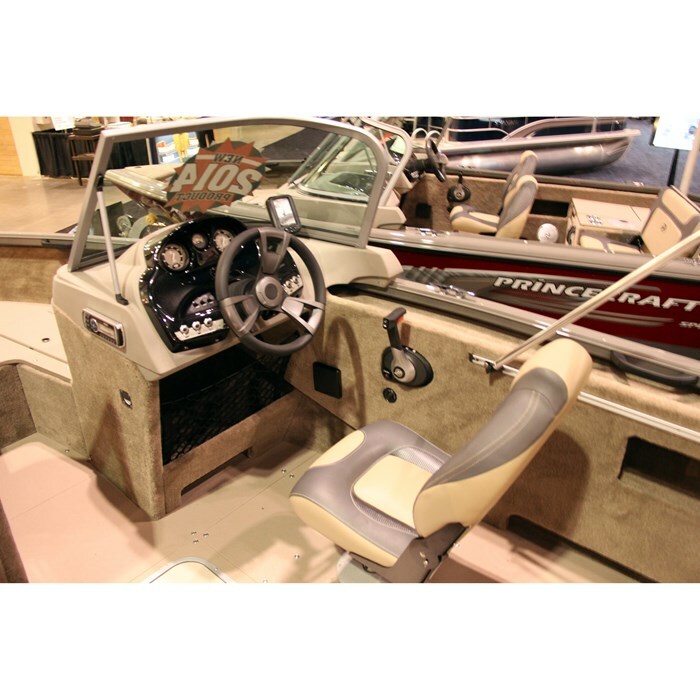 This year, Princecraft again offers three main categories of aluminum boats; fishing, deck, and pontoon boats. The Sport 177 is one of four models ranging from sixteen and a half to eighteen and a half feet in Princecraft’s Sport series of fishing boats. 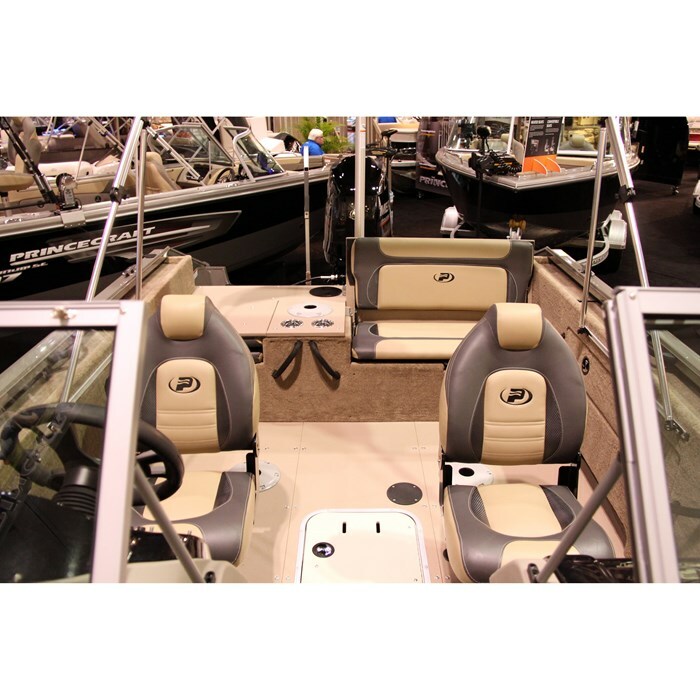 There are nine series in the fishing boat category comprising a total of forty-four models ranging from ten feet to twenty feet in dual console walk-thru’s, side consoles, tiller, utility, cartoppers, and jon boats. Princecraft also offers six models of aluminum deck boats plus thirty-one models of outboard, sterndrive, and even electric powered pontoon boats in eight series from fifteen to twenty-nine feet. 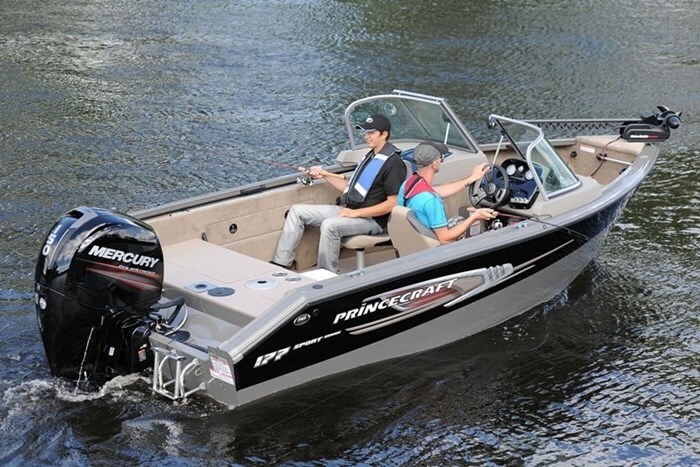 Princecraft’s Sport series is intended to satisfy the needs of both fishing and watersports enthusiasts by including those features necessary to the enjoyment of both activities and by offering optional equipment to allow you to equip the boat even better suited to your most prominent boating priorities and desires. To this end, all four models in the Sport series, including the Sport 177, have both helm and passenger consoles plus full, high, tinted and curved protective glass windshields with a walk-thru centre portion allowing access to the bow area. The raised bow casting platform features a centre-mounted in-floor pedestal seat base and on the port side, a 30-inch, 17-gallon ProFlo™ electric-filled, lit, aerated livewell with intermittent recirculation, anti-spill insulated lid and with removable divider. On the starboard side of this bow casting platform is an in-floor cooler / ice box of the same size as the livewell on the port side. This cooler can of course be used for storage if so desired. At the point of the bow is the carpeted raised platform which is flush with the gunnels on which to mount one of six optionally available MotorGuide or MinnKota 12 or 24-volt trolling motors. The boat is pre-wired for both of these voltages and a plug and receptacle is provided. Seat cushions are factory available to convert this area for bowrider passenger use. Two folding pedestal seats are standard with the Sport 177 to be used in any of the six floor seat bases provided. Optional removable seat choices are available and even a passenger fold-down sleeper seat option can be installed. The driver’s helm console comes standard with a tachometer, speedometer, and fuel gauge which may be upgraded with the highly recommended and sophisticated Mercury SmartCraft gauges. A tilt steering wheel and driver’s seat slider are also available as is hydraulic steering and a starboard side windshield wiper. Storage with cargo netting is provided under the driver’s console and specific deep-cycle battery storage is found beneath the passenger console as well as a glove box up top. The standard easy cleaning vinyl flooring throughout the Sport 177 may be upgraded with carpet if so desired. While here at the consoles, you may also want to add one of two available stereo systems from Jensen or Clarion, perhaps a co-pilot system for a specific MinnKota trolling motor, or choose from one of several Lowrance or Humminbird fishfinder or GPS combinations. 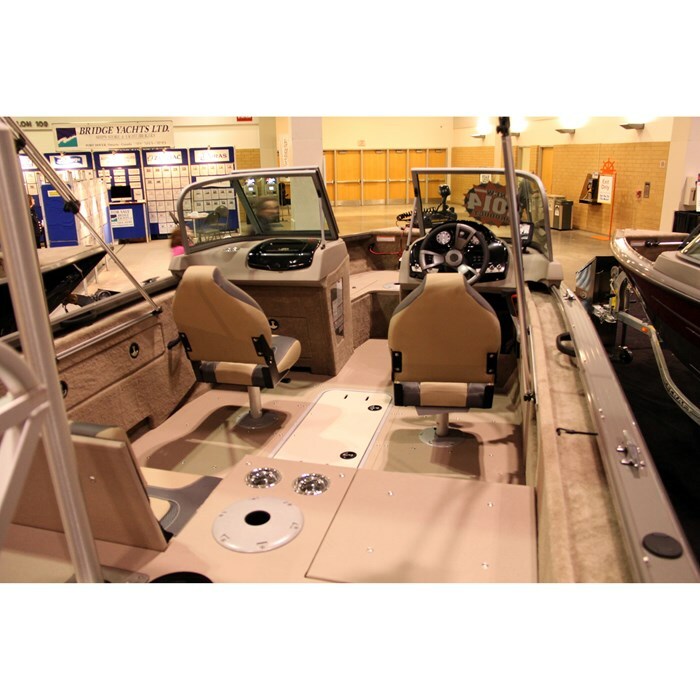 In the cockpit of the Sport 177 you’ll find a lockable 7-foot rod storage locker on the port side plus an in-floor lockable rod organizer for four rods. These lockable storage compartments will of course handle a variety of watertoys and watersports accessories as well. Open storage is found beneath the starboard gunnel. The stern raised casting platform of course has not only the requisite in-floor seat base but also two central cupholders to serve the two convenient flip-up upholstered stern seats – a double-wide on the port side and a single on the starboard side. 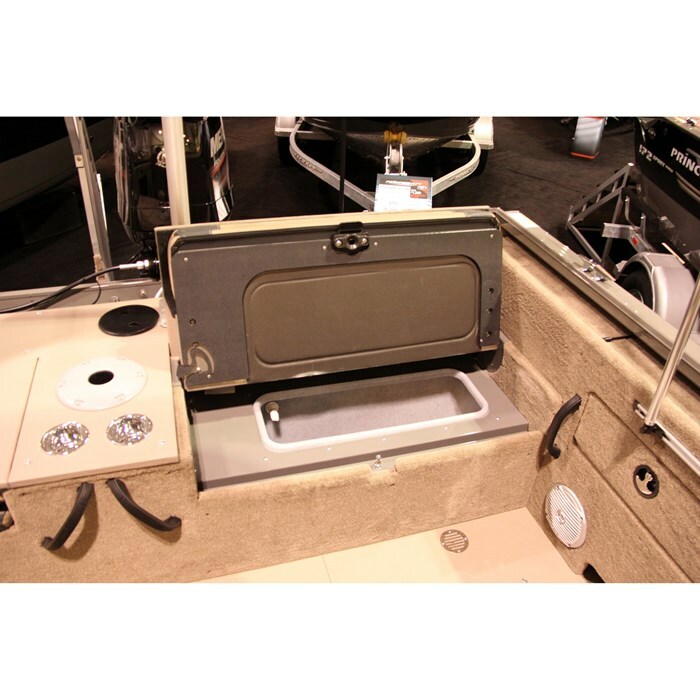 Under the port seat cushion is an even larger 44-inch, 20-gallon SportFlo™ livewell with the same features as the bow unit but with an added removable minnow bucket. Under the starboard stern seat cushion is a battery storage compartment. Three Mercury 4-Stroke outboard engine choices are offered for the Sport 177; a 90, 115, or 150 horsepower. 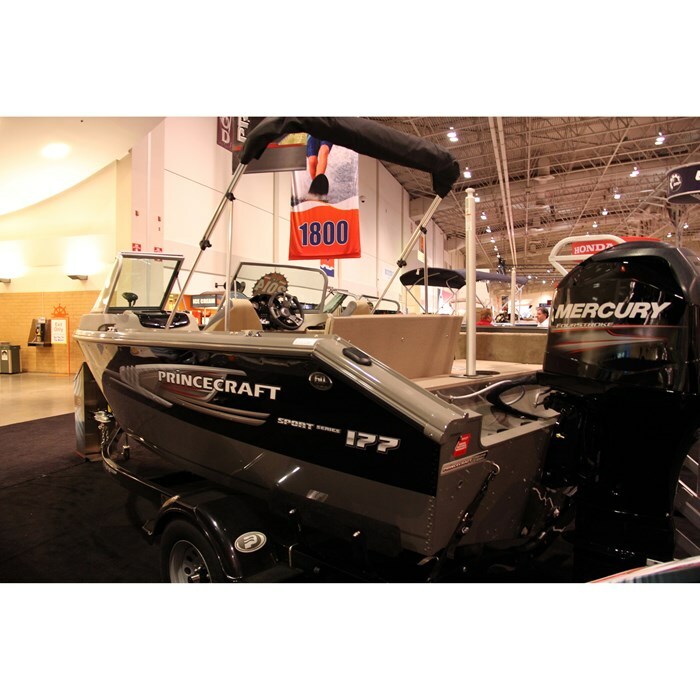 A remote-controllable Mercury 9.9 horsepower Pro Kicker 4-Stroke motor is also available. The standard trailer available in the package pricing is a black painted single axle carpeted bunk trailer. This may be upgraded to a galvanized trailer and several upgraded options are available for either selection. Other options you may wish to consider include canvas covering choices including a full stand-up enclosure, onboard battery charger, a removable ski pylon, and a stern boarding ladder. Various colour and graphic options are also available. For a seventeen and a half foot boat, Princecraft has certainly packed the Sport 177 full of desirable features to satisfy both the fishing and the watersports enthusiast.